Biography*: He succeeded to the title of 6th Earl of Buchan [S., c. 1115] in 1233. He held the office of Justiciar [Scotland] between 1251 and 1255. He held the office of Justiciar [Scotland] between 1257 and 1289. He inherited large estates in Galloway, Fife, and the Lothians. He held the office of Constable of Scotland in 1270. On 4 February 1283/84 he was one of the nobles who engaged to maintain the succession to the Crown of Margaret of Sctoland. In 1285 he was one of the six Guardians on the death of King Alexander III. Alexander Comyn, 2nd (sic) Earl of Buchan (died 1289) was a Scoto-Norman magnate who was one of the most important figures in the 13th century Kingdom of Scotland. He was the son of William Comyn, jure uxoris Earl of Buchan, and Marjory, Countess of Buchan, the heiress of the last native Scottish Mormaer of Buchan, Fergus. During his long career, Alexander was Justiciar of Scotia (1258–89), Constable of Scotland (1275–89), Sheriff of Wigtown (1263–66), Sheriff of Dingwall (1264–66), Ballie of Inverie (in Knoydart) and finally, Guardian of Scotland (1286–89) during the first interregnum following the death of King Alexander III. In 1284 he joined with other Scottish noblemen who acknowledged Margaret of Norway as the heiress to King Alexander. He died sometime after 10 July 1289. Lord Alexander Comyn, sheriff of Aberdeen, married Joan, sister of William le Latimer, and had issue. Henry de Beaumont would claim the Earldom of Buchan through marriage to their daughter, Alice. [S746] Wikipedia, online http://Wikipedia.com, http://en.wikipedia.org/wiki/Alexander_Comyn,_Earl_of_Buchan. [S746] Wikipedia, online http://Wikipedia.com, https://en.wikipedia.org/wiki/Patrick_IV,_Earl_of_March. Biography*: Simon of Dammartin (1180 – 21 September 1239) was a son of Alberic II of Dammartin (Aubry de Dammartin) and his wife Mathildis of Clermont. Simon was the brother of Renaud I, Count of Dammartin, who had abducted the heiress of Boulogne, and forced her to marry him. It is thought that in order to strengthen the alliance with the Dammartins, King Philip Augustus of France allowed Simon to marry Marie, Countess of Ponthieu, who was a niece of the king, in 1208. Renaud and Simon of Dammartin would eventually ally themselves with John, King of England. In 1214 the brothers stood against Philip Augustus in the Battle of Bouvines. The French won the battle, and Renaud was imprisoned, while Simon was exiled. Marie's father William IV, Count of Ponthieu had remained loyal to Philip Augustus. When William died in 1221, Philip Augustus denied Marie her inheritance and gave Ponthieu in custody to his cousin Robert III, Count of Dreux. After the death of Philip Augustus, Marie was able to negotiate an agreement with his successor Louis VIII in 1225. Ponthieu was held by the king, and Simon would only be allowed to enter this or any other fief if he obtained royal permission. In 1231 Simon agreed to the terms and added that he would not enter into marriage negotiations for his daughters without consent of the king. Simon married Marie, Countess of Ponthieu, the daughter of William IV, Count of Ponthieu and Alys, Countess of the Vexin. Marie became Countess of Ponthieu in 1221. Joan, Countess of Ponthieu (1220–1278), married 1) Ferdinand III of Castile. Mother of Eleanor of Castile, the wife of Edward I of England. Married 2) Jean de Nesle, Seigneur de Falvy et de La Hérelle. Philippe of Dammartin (-1280), married 1) Raoul II of Lusignan, 2) Raoul II, Lord of Coucy, 3) Otto II, Count of Guelders. Biography*: Marie of Ponthieu (17 April 1199 – 1251) was the Countess of Ponthieu and Countess of Montreuil, ruling from 1221 to 1251. Marie was the daughter of William IV of Ponthieu and Alys, Countess of the Vexin, and granddaughter of King Louis VII of France by his second wife Constance of Castile. As her father's only surviving child, Marie succeeded him, ruling as Countess of Ponthieu and Montreuil from 1221 to 1251. She married Simon of Dammartin before September 1208. He was the son of Alberic II of Dammartin and Maud de Clermont, daughter of Renaud de Clermont, Count de Clermont-en-Beauvaisis and Clemence de Bar. Simon and Marie had four daughters but only two are recorded. The eldest was Joan of Dammartin (1220- 16 March 1279), second wife of Ferdinand III of Castile. The other daughter was Philippa of Dammartin (died 1277/81) who married firstly Raoul II d' Issoudun, secondly Raoul II de Coucy, and thirdly Otto II, Count Geldern. [S746] Wikipedia, online http://Wikipedia.com, https://en.wikipedia.org/wiki/Marie,_Countess_of_Ponthieu. [S746] Wikipedia, online http://Wikipedia.com, http://en.wikipedia.org/wiki/Marie,_Countess_of_Ponthieu. Biography*: Alberic II of Dammartin (Aubry de Dammartin) (died 1200 AD) was a French count. Renaud I, Count of Dammartin (c. 1165–1227), married 1) Marie de Châtillon and 2) Ide de Lorraine. [S746] Wikipedia, online http://Wikipedia.com, http://en.wikipedia.org/wiki/Simon,_Count_of_Ponthieu. Biography*: Thomas I or Tommaso I (1178, Aiguebelle – 1 March 1233) was Count of Savoy from 1189-1233. He was the son of Humbert III of Savoy and Beatrice of Viennois. His birth was seen as miraculous; his monkish father had despaired of having a male heir after three wives. Count Humbert sought counsel from St. Anthelm, who blessed Humbert three times, and it was seen as a prophecy come true when Thomas was born shortly before Anthelm himself died on 26 June 1178. He was named in honour of Saint Thomas Becket. Thomas was still a minor when his father died on 4 March 1189, and a council of regency was established, composed of his mother Beatrice, his father's cousin Boniface I of Montferrat, and the Bishop of Saint-Jean-de-Maurienne. He had reached his majority by August 1191. Thomas possessed the martial abilities, energy, and brilliance that his father lacked, and Savoy enjoyed a golden age under his leadership. Despite his youth he began the push northwest into new territories. In the same year he granted Aosta Valley the "Carta delle Franchigie", recognising the right to administrative and political autonomy. This right was maintained up until the eve of the French Revolution. Later he conquered Vaud, Bugey, and Carignano. He supported the Hohenstaufens, and was known as "Thomas the Ghibelline" because of his career as Imperial Vicar of Lombardy. In 1195 he ambushed the party of Count William I of Geneva, which was escorting the count's daughter, Margaret of Geneva, to France for her intended wedding to King Philip II of France. Thomas carried off Marguerite and married her himself, producing some eight sons and six daughters. Avita of Savoy (1215-92) who married Baldwin de Redvers, 7th Earl of Devon and Robert Aguillon (d.1286). 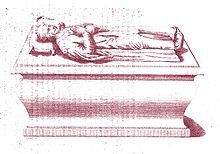 Biography*: Marguerite of Geneva (died 1252) was the daughter of William I, Count of Geneva and Beatrice de Faucigny. She was supposed to become the third wife of Philip II of France but was abducted by Thomas I of Savoy in 1195, while on her way to Paris. Thomas then married her himself, claiming that Philip II was already married (the French King had married Ingeborg of Denmark in 1193 but had repudiated her soon thereafter). She was the direct matrilineal ancestor of Mary, Queen of Scots. Biography*: Umberto III (1135, Avigliana, Piedmont – 1189), surnamed the Blessed, was Count of Savoy from 1148 to 1189. His parents were Amadeus III of Savoy and Mahaut (or Mafalda, or Matilda) of Albon, the sister of Guy IV of Dauphinois. His memorial day is March 4. Umberto III, who reigned from 1149 to 1189...was a man of irresolute spirit who was disconsolate at being born a prince and preferred the seclusion of a monastery. He only renounced his chosen state of celibacy so as to give his land an heir. His first wife died young; his second marriage ended in divorce. Umberto gave up and became a Carthusian monk. However, the nobles and common people of Savoy begged him to marry yet again, which he reluctantly did. This third wife gave him two more daughters, and Umberto attempted to return to the monastic life yet again. Finally he was prevailed upon to marry for a fourth time, and this wife, Beatrice, produced the son who would ultimately succeed him. In 1188 he founded the Monastery of Sant'Antonio di Ranverso. Biography*: Amadeus III of Savoy (1095 – April 1148) was Count of Savoy and Maurienne from 1103 until his death. He was also known as the Crusader. He was born in Carignano, Piedmont, the son of Humbert II of Savoy and Gisela of Burgundy, the daughter of William I of Burgundy. He succeeded as count of Savoy upon the death of his father. Amadeus had a tendency to exaggerate his titles, and also claimed to be Duke of Lombardy, Duke of Burgundy, Duke of Chablais, and vicar of the Holy Roman Empire, the latter of which had been given to his father by Henry IV, Holy Roman Emperor. He helped restore the Abbey of St. Maurice of Agaune, in which the former kings of Burgundy had been crowned, and of which he himself was abbot until 1147. He also founded the Abbey of St. Sulpicius in Bugey, Tamié Abbey in the Bauges, and Hautecombe Abbey on the Lac du Bourget. In 1128, Amadeus extended his realm, known as the "Old Chablais", by adding to it the region extending from the Arve to the Dranse d'Abondance, which came to be called the "New Chablais" with its capital at Saint-Maurice. Despite his marriage to Mahaut, he still fought against his brother-in-law Guy, who was killed at the Battle of Montmeillan. Following this, King Louis VI of France, married to Amadeus' sister Adélaide de Maurienne, attempted to confiscate Savoy. Amadeus was saved by the intercession of Peter the Hermit, and by his promise to participate in Louis' planned crusade. In 1147, he accompanied his nephew Louis VII of France and his wife Eleanor of Aquitaine on the Second Crusade. He financed his expedition with help from a loan from the Abbey of St. Maurice. In his retinue were many barons from Savoy, including the lords of Faucigny, Seyssel, La Chambre, Miolans, Montbel, Thoire, Montmayeur, Vienne, Viry, La Palude, Blonay, Chevron-Villette, Chignin, and Châtillon. Amadeus travelled south through Italy to Brindisi, where he crossed over to Durazzo, and marched east along the Via Egnatia to meet Louis at Constantinople in late 1147. After crossing into Anatolia, Amadeus, who was leading the vanguard, became separated from Louis near Laodicea, and Louis' forces were almost entirely destroyed. Marching on to Adalia, Louis, Amadeus, and other barons decided to continue to Antioch by ship. On the journey, Amadeus fell ill on Cyprus, and died at Nicosia in April 1148. He was buried in the Church of St. Croix in Nicosia. In Savoy, his son Humbert III succeeded him, under the regency of bishop Amadeus of Lausanne. [S746] Wikipedia, online http://Wikipedia.com, http://en.wikipedia.org/wiki/Umberto_II,_Count_of_Savoy.